The patented Accu-Freez system is the most advanced pipe freezing system in the world. 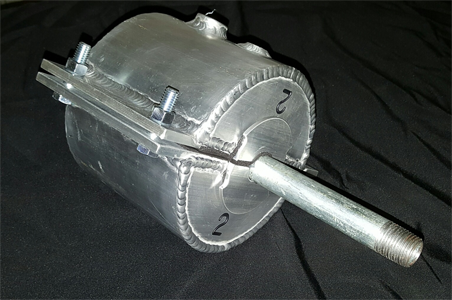 It utilizes liquid nitrogen in a controlled and automated system to safely and reliably freeze static liquids in a selected section of pipe or tubing. 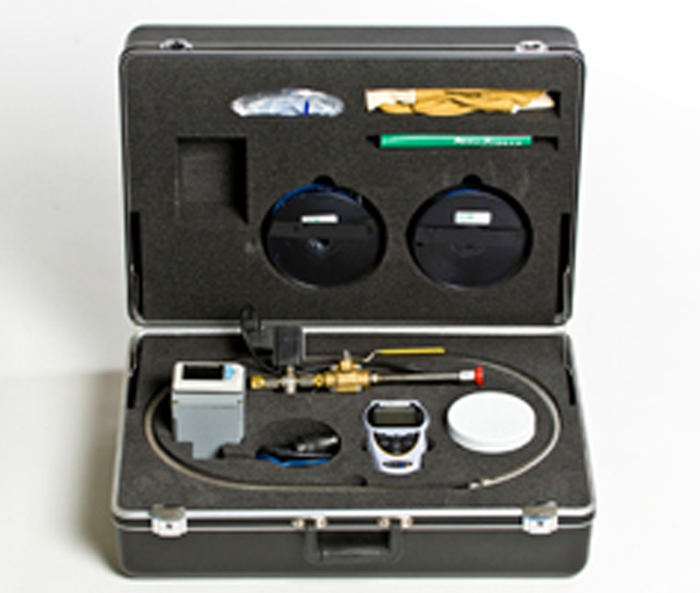 The standard Accu-Freeze AF1000 Kit is used to create an in-line ice plug capable of withstanding 2000 PSI in pipes up to 12 inches in diameter and can be modified to handle even larger diameter jobs. Ice plugs (or “freeze seals”) temporarily isolate sections of pipe for as long as necessary, allowing repairs or modifications to be made without shutting off or draining down the entire system. A typical Accu-Freeze process starts with wrapping copper tubing and a specially designed insulating jacket around the section of pipe to be frozen. The liquid nitrogen is supplied by your local welding or gas supplier. The nitrogen is then injected through the control system. By constantly reading the surface temperature of the pipe, the Accu-Freeze system controls the flow of liquid nitrogen through the coil of copper tubing and safely creates the ice plug under the area covered by the copper tubing and insulating jacket only. The plug does not extend outside the specific “freeze zone”. Accu-Freeze utilizes liquid nitrogen in a controlled system to freeze stationary liquids in a selected section of pipe or tubing. By controlling the surface temperature of the pipe, Accu-freeze can accurately and safely form an in-line ice plug, capable of withstanding 2000 psi in pipes up to 12 inch diameter. This temporary plug isolates the section, thus allowing repairs and modifications to be made without shutting off or draining down the entire system. In response to these needs in the industry, COB Industries introduced Accu-Freeze –the world’s first controlled liquid nitrogen pipe freezing system, and the most efficient pipe freezing system available. 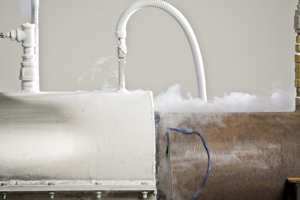 While liquid nitrogen (LN2) freeze systems are commonly used to handle situations involving larger diameter pipe and hard to freeze applications such as glycol or oil lines, etc, most LN2 freeze methods are very costly and require considerable logistics due to the amount of liquid nitrogen that is typically required to perform a freeze. The Accu-Freeze system is completely unique in that it utilizes a patented control system which automates the injection of liquid nitrogen and allows the operator to accurately control the temperature of the pipe wall throughout the freeze process. This dramatically reduces the amount of liquid nitrogen that is consumed which reduces the operating costs to a small fraction of what would normally be expected. This means by using Accu-Freeze™, you get the benefits and capabilities that liquid nitrogen offers without the costs that are normally associated with using it. Accu-Freeze can be used with existing freeze equipment or with cost-effective copper tubing. The copper coil method of freezing is very beneficial from a cost standpoint because it eliminates the need to purchase a specific freeze jacket for each size of pipe (sometimes referred to as a “clam-shell”, these are typically made from aluminum and bolted around the exterior of the pipe). Accu-Freeze™ can also be used for the benefits of reducing liquid nitrogen use and operating costs in conjunction with existing freeze jackets if the customer has already invested in them. In addition, COB Industries now offers state of the art Freeze Jackets as well for customers that prefer that method or for applications where the jackets are more conducive. Accu-Freeze also provides the unique ability to control the freeze remotely from a secure location, reducing potential risks to the operator in certain applications. The controlled freeze process safely creates the ice plugs without affecting the integrity of the pipe. (Pipe bursts happen when ice forms in an uncontrolled manner and creates hydro-static pressure between ice plugs or against a closure in the line.) Detailed operating instructions are provided to help the user select an appropriate location to safely freeze the line. In the power generation industry there are also restrictions regarding exposure of certain pipes to cryogenic temperatures. Accu-Freeze makes it possible to create an ice plug while keeping the pipe wall temperature within the allowable temperature limits. COB Industries now manufactures Freeze Seal Jackets (“clam-shell” style) in addition to the standard Accu-Freeze kits. These jackets are popular with customers that need to do repeated freezes on the same size or sizes of pipe. The amount of set-up time is greatly reduced with Freeze Seal Jackets that are manufactured to fit specific pipe sizes and are just bolted around the outside of the pipe. The jackets have injection ports built in which connect to the LN2 feed and exhaust ports to vent the gas to atmosphere. They are constructed of high-grade aluminum with a double-wall design that creates an insulating air gap between the liquid nitrogen and the ambient air outside the jackets. Introducing the new AF1099 Adaptor Kit. Adapts our 2” Accu Jacket to fit ½”, ¾”, 1” and 1 ½” pipe sizes.